If there’s one thing you must grasp if you wish to experience an increase in productivity and a strong sense of achievement day to day it’s the concept that not every task is created equal. This is especially true when it comes to those things which when completed will lead to a greater sense of accomplishment & feeling of success and achievement. Far too many people look at having completed the items on their To Do lists as a sure sign that they’re achieving at a great level. The problem with this line of thinking is that in many cases the items which make it onto our lists are little more than busy work — items which do require attention, but in the grand scheme of things having completed them doesn’t serve us in a greater capacity with respect to our larger, more important goals — the big things that when completed actually move us closer to our grand vision — the one we hold for our lives, whether personal or professional. The challenge is that while you may feel like you’re making progress, because after all, you are checking items off during the day — if you’re not taking a careful inventory and ensuring that the things you are working on in the first place will yield your greatest R.O.I.O.T (return on investment of time) then it’s likely that you will end up feeling as though the larger life plans you hold for yourself aren’t making any headway. Which by the way you would be correct, they aren’t, not because you aren’t working, but because you’re not working and putting forth the necessary effort into the specific task needed to yield the exact true result you are after. That’s why I say, all tasks aren’t created equal. Commit this to memory — and always be asking the question “If I work on this task, when completed will it yield the greatest overall result and sense of accomplishment for me. Will having achieved it move me closer to my larger plan?” If the answer you get back is anything but a resounding yes then you need to reschedule what it is you’re planning to work on and replace it with a task that will yield you the greatest return on investment of time (R.O.I.O.T). It’s that simple. You and I have a choice as to what we give our time to. We don’t have a choice as to how much time we have. No matter how hard we try we’re not going to be able to squeeze anymore than 24 hours out of our day. The good news is you don’t even have to try IF you’ll grasp and put into practice the ongoing habit of asking the question mentioned above, and working on those items which when completed will yield the greatest results. To clarify here’s a make believe To Do list item — I’ve made reference to an example which will serve you the best and one which might be more in line with “busy work”, which may make you feel good to get them done, but in the grand scheme of things won’t serve you had you instead chosen to spend your time on other things. * Vacuuming the house – while this can certainly be a worthwhile undertaking, is it really as important say if you’re larger goal was to “increase your sales for the month”? No of course it isn’t. A far more effective use of your time would be to schedule this as a lower priority item, or find a way to have someone else do it for you if that’s a possibility. While it may feel nice to complete this task, it’s not going to yield the same result if you were to replace this task with one such as “give a follow-up call to the people I met at the seminar I attended who showed an interest in my product or service”. As you can see the latter is going to move you closer to what you’ve identified as your most important goals. Plus, once you’ve completed the tasks which will have the greatest return on your investment of time then you can go ahead and knock out the other things. The key thing to remember is that you’ve got to be vigilant in working on and first completing those items which will give you the greatest return on your time spent. 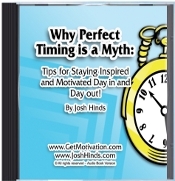 * Hire motivational speaker Josh Hinds to appear at your next event, seminar or conference. -What are your thoughts? Do you have any ideas to help with improving productivity?